Our current stock of available restored antique pool tables always includes quality examples of the world's most rare and unique designs produced by a variety of manufacturers. Available antique pool tables from the Brunswick-Balke-Collender Company, or its predecessors include fine examples of the Brunswick Monarch, Brunswick Exposition Novelty, Brunswick Brilliant Novelty, Brunswick Nonpariel, Brunswick Manhattan, Brunswick Cambridge, Brunswick Narragansett, Brunswick Regina, Brunswick Medalist, Brunswick Alexandria, Brunswick Arcade, Brunswick Jewel, Brunswick Chicago, Brunswick Champion, Brunswick Conqueror, Brunswick Hudson, Brunswick Northern, Brunswick St. Bernard Mission, Brunswick Old Mission, Brunswick Home Comfort, Brunswick Newport. 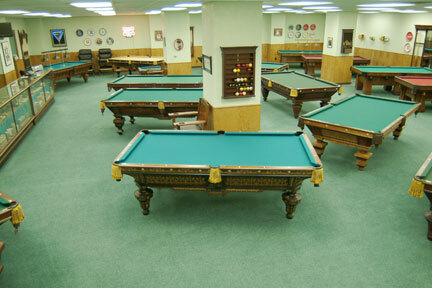 In addition, we feature antique pool tables from other manufacturers such as H.W. Collender Company, Julius Balke Company, Emanuel Brunswick, O. L. Briggs Company, Benedict Company, National Billiard Company, A. E. Schmidt Pool Table Company, Stephanie & Hart Pool Tables, John Brunswick, B. A. Stevens Company, and many others. We also have on display a wide variety of antique billiard accessories to provide the perfect accent for any of our antique pool tables. These include antique pool cues and pool cue racks, antique pool balls and pool ball racks, antique light fixtures, antique spectator chairs and game room furniture. Vintage pool and billiard memorabilia is also available for that final touch in recreating the look and feel of an antique billiard room or antique game room. Whether you need antique Brunswick letterheads and telegrams or you need antique salt shakers and beer coasters, you will find them all among the rare items available in our inventory.